Would you love to have a private lesson with Mary but live too far away? An online session may be the answer! For your dog, cat or horse: Is your senior pet getting stiff or slow? Is your pet recovering from an injury or illness? Is your dog anxious? Do you wish to bond more deeply with your animal companion? I can teach you how to help improve your pet’s overall well-being and functioning. Not everyone will qualify for an online session for their animal. You’re willing to spend time (about 15 minutes a few times a week) facilitating a deep, healing connection with your animal. Mary can teach you how to do this. You’re familiar with Mary’s book, “Grow Young with Your Dog.” or my video program, “Age-Proofing Your Dog.” (Even if you’re a cat person!) If you’re a horse person, you’ve read several of her equine blog posts or attended one of Mary’s workshops or clinics. Online sessions with Mary are conducted via Zoom. Your investment is $147 and the recording is yours to keep*. Contact Mary to learn if an online session would be a right fit for you. I’m here to help. *Recordings allow you to refer back to the information presented in the online session. You won’t have to rely on your memory! The recording is for the client’s private use only. 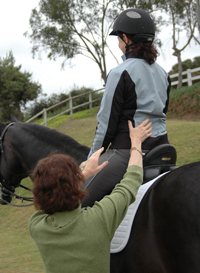 Mary travels internationally to horses and riders improve their movement, connection and well-being. She offers private sessions for horses and riders, as well as group workshops. For information about our equine workshops, please visit our Horse & Rider Workshops page. For information about our canine workshops, please visit our Canine Workshops page. Contact Mary if you would like to learn more about her group clinics and workshops. Mary demonstrates how to help an injured dog walk more comfortably. Mary teaches workshop participants how to help a horse become more supple through the rib cage.